Splicing in a new defrost thermostat on a refrigerator evaporator coil. Note the heat shrink on the splice connection. This is to prevent moisture from migrating into the splice connection and rotting it out. An alternate technique would be to use a dab of silicone in the open end of the terminal crimp connector. Pigtail wire nuts are not a reliable splice connector in this environment, crimp connections only. 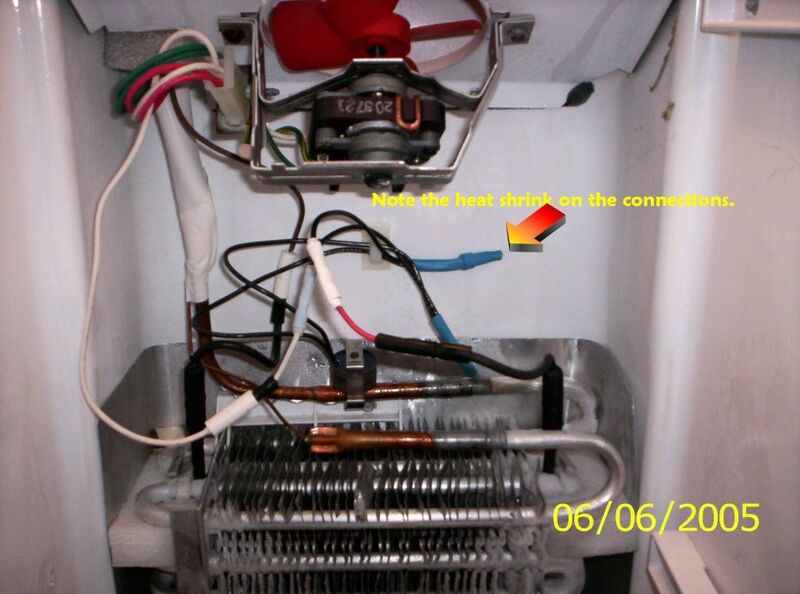 This entry was posted in Refrigerator Repair on June 10, 2005 by Samurai Appliance Repair Man. I recently found some crimp connecters at the local automotive parts store that were filled with a low temperature melting sealant AND covered with heat-shrink tubing. 🙂 They are called weatherproof connectors, and would be just dandy for this type application. They were only slightly higher priced than the regular types. Just a suggestion. You need to put your meter on the wires and see what you really have there for voltage. For more help, come see us in The Samurai School of Appliantology.